This article covers how to add Wish marketplace as a sales channel to your Zentail account in a few simple steps. As reputable as Zentalians are, you will still need to be approved by Wish before taking the following actions. 1. Use the chat feature to contact support and request to be added to the wait list for Wish. 2. Go into your integrations page and click the Wish card, then click the teal Authenticate button. 3. You'll be redirected to Wish, where you'll need to login to your account and confirm that you'll provide Zentail access. 4. Once confirmed, you'll be redirected to Zentail. You can login and check your integrations page to confirm that the Status is Authenticated, and when you'll need to re-authenticate your account. When you're ready to start listing products, you can also enabled the product data feed here. Warehouses - By default, your Wish channel will be enabled for each warehouse. 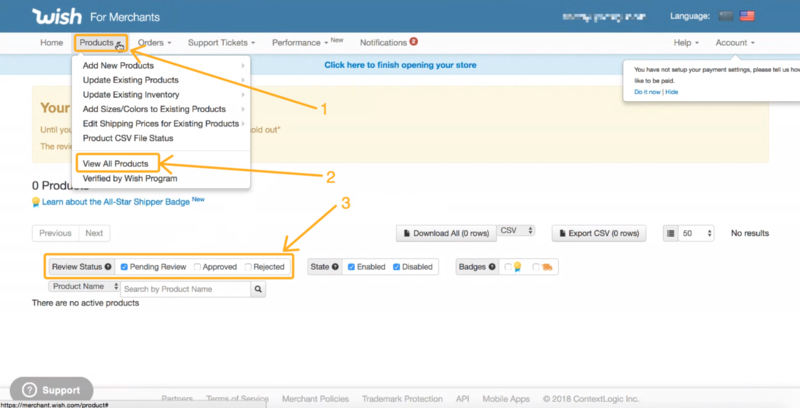 If you don't want to make the inventory in a specific warehouse available for Wish, follow these steps in this article on disabling a fulfillment method for a specific channel. ShipStation - If you plan to fulfill Wish orders using ShipStation, be sure to check off Wish on your ShipStation integration and select the store you would like the orders to be routed into. For help, see the last section of this article on how to connect ShipStation. Within 30 minutes you should be able to view these products on your Wish account here. Although, any new products will go under review being visible. On average the review takes about 3 days.